■ Bounced back the inferior play of the 1st half in the 2nd half. The J1 league 11th round match, away at home of Jubilo Iwata became one tough game for Cerezo Osaka. It was the 1st match of series of 3 games in the Golden Week. All the tickets were sold out in advance, under fine weather with sunshine, the stadium was filled with the heat of excitement. 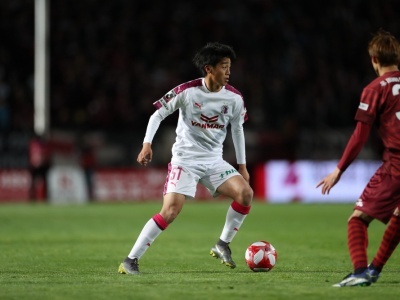 At the beginning, Cerezo pushed well with earning 3 corner kicks in a row, and fought evenly for a while, however slowly fell into the situation that they couldn’t move the ball forward under Iwata’s intensive press. Especially when Cerezo started struggling at Iwata’s left side, i.e. Cerezo’s right side, in 25th minute, they were intercepted a pass by Takuya Matsuura of Iwata, the ball was delivered down the line and Iwata made a cross. Kengo Kawamata of Iwata jumped onto the cross and executed the opening goal with powerful header. Prior to the match, Yoon Jung-Hwan was saying “the important thing is, not allow to losing any goal. 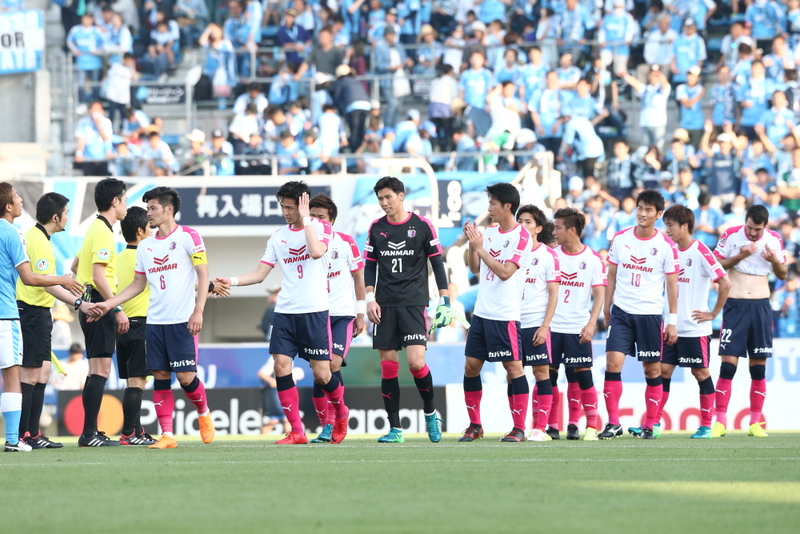 By losing the opening goal to opponent in such hard schedule, it would force us to play tough”, and also after the 1st loss, Cerezo nearly lost another goal by their own error, and kept their uncertain play. Even when they attacked, they failed to take the ball into Iwata’s vital area, and had ‘zero’ shot in the 1st half. The dependable Hiroshi Kiyotake was kept pushing down at low position of the pitch, and couldn’t allow to do any fatal work in front of the goal. As Kenyu Sugimoto said, it was “feel like it was lucky that we lost only one goal and no more” 1st half for Cerezo, however, the flow was changed in the 2nd half. Totally transformed from the 1st half, they carried ball to high position, and created chances starting by aside of Iwata’s defence line. In 51st minute, started from Yusuke Maruhashi, they linked passes smoothly to Sugimoto, Kiyotake and to Yoichiro Kakitani, then Kota Mizunuma jumped in from the other side onto the cross Sugimoto sent and threaten the goal. Then, that flow they created led Cerezo to make the game to draw. In 54th minute, the down the line pass came from Maruhashi at left side was received by Sugimoto in the penalty box, he carried it on by dribbling, and that caused Iwata’s defender’s foul. Cerezo earned a penalty kick. The penalty kick was the first shot of this game for Cerezo, taken by Sugimoto himself and calmly executed, in 56th minute, the game has turned back to the starting point. 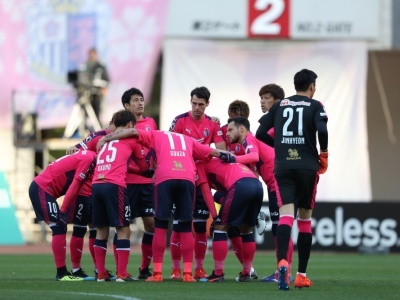 Cerezo wanted to go for all the way to come-from-behind, however, by Iwata’s fight with their determination of not losing consecutive games at home, the tolerance time continued for Cerezo. And it was Kota Fujimoto who started as a starting member at 1st time for J1 league match in this season, and Matej Jonjic, the Centre back pair, who worked so hard in this daunting time. They cleared opponent’s crosses many times, and in 88th minute, when Iwata succeeded to break through the side and made a fatal shot, Matej Jonjic blocked it by throwing his body away. Didn’t allow Iwata to score the second. In 86th minute, Cerezo had a big chance. The substitute Takaki Fukumitsu made through to behind the opponent’s defence line after the one-two with Kiyotake in front of the goal, however the return from Kiyotake was just a step short, and both guys showed their frustration. Also in 89th minute, from counter attack, also substitute Yang Dong-Hyun managed to take a shot, however the ball was out of the frames, and the match ended as it was, 1-1 draw.